A lot of beautiful landscapes simply disappear at sundown and remain hidden (and sometimes unsafe) until the sun brings them back to light and to life. Different locations and uses require different kinds of lighting. By carefully planning your outdoor illumination needs, you can turn that lonely-looking porch or door into the central focus of a beautiful and useful night landscape. Among the types and uses for landscape lighting, consider the ones in this list and think of how they could improve your property’s appeal after dusk. 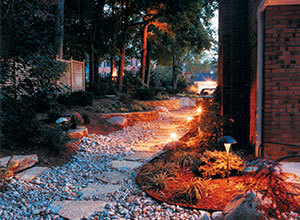 Path and walkway lighting is one of the most important functions of low level lighting. Fixtures should cast symmetrical light patterns and be mounted low enough to avoid eye glare while clearly showing the path and highlighting plants along the way. 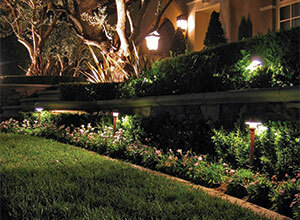 Spread lighting illuminates beds of ground cover or low shrubs to bring them to life in an otherwise dark area. Security lighting is the result of strategically placed flood and spot lights at key areas around your property to deter would be intruders. 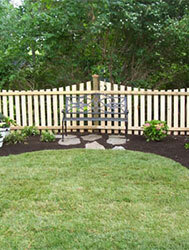 Silhouette lighting is concealed on the ground directly behind the wall, sculpture, or plant being silhouetted. Shadow lighting is a lot like silhouetting but done from the front instead of the back of the plant, casting interesting shadows of a plant or other object on a wall behind. 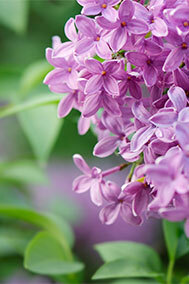 Spot lighting is used to create dramatic highlights on statuary, shrubs or a building. This type of lighting is direct but should be soft and subtle enough to enhance the appearance of what you’re lighting without casting harsh shadows. Even a few carefully selected and installed lights can make a huge difference in the way you see, enjoy and use your property after dark. There are many brands and types of lighting available. If you have questions on “lighting up your nights” feel free to give us a call anytime.